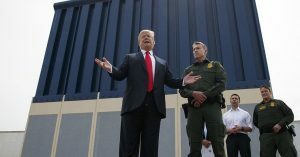 When President Trump said Monday at a campaign rally in El Paso that, “We’ve actually started a big, big portion of the wall today at a very important location, and it’s going to go up pretty quickly over the next nine months,” I assumed it was nonsense he was spreading in hopes that his supporters might not mob him on stage for so far failing to keep the central promise of his campaign. checked in with agents at the Rio Grande Valley border sector to see if they knew what new “wall” Trump was talking about. They sent me information on construction for new border barrier announced last year. The project funds six miles-worth of concrete and steel barrier of the sort that agents told me in January is immensely successful in deterring illegal border crossings. And the $145 million for it didn’t come from some long-ago-passed funding bill passed under former President Barack Obama. It was included in U.S. Customs and Border Protection’s budget for fiscal year 2018. Unlike other parts of new barrier construction and reparation, Trump can actually take credit for this one!